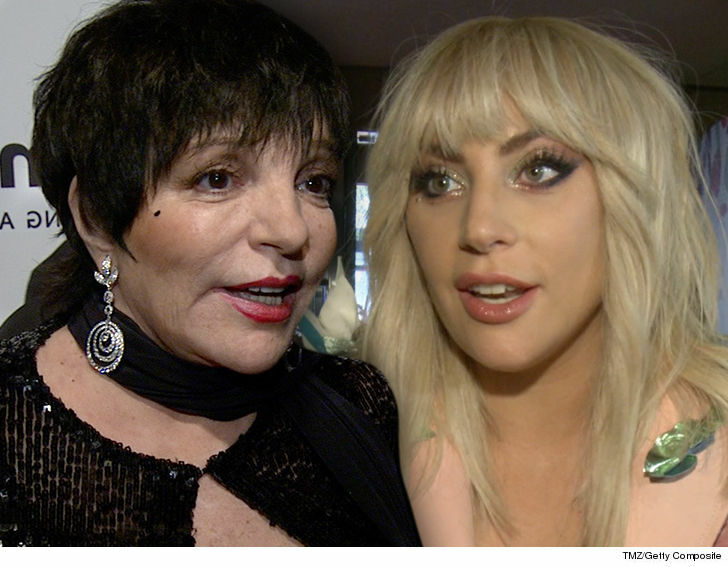 Liza Minnelli typically slams or boycotts movies associated with her mom, but Lady Gaga's role in "A Star Is Born" could totally change Minnelli's mindset ... TMZ has learned. Sources close to Liza tell us she absolutely adores Gaga, and it's likely she'll actually go and see the singer play the role her mother, Judy Garland, once filled. If you didn't know -- and if you're under 55, that's likely -- Judy starred in the 1954 version of the movie. Liza's said she rarely, if ever, watches reboots of Garland flicks ... out of respect for her mother. The trailer for the new film dropped Wednesday and there's a ton of buzz. We're told Liza and Gaga are friends who admire each other's work ... so, that's why she's considering breaking her Garland rule. The latest 'Star' is actually a remake of a remake of a remake. It goes all the way back to 1937 when Janet Gaynor had the lead, then Garland's version, then Barbra Streisand in 1976 ... and now Gaga. See? What's old really is new. Several times. Liza Minnelli Shoots Down Rumors, Proves She Can Still Sing!